Vancouver boot camp, Fit Body Boot Camp, is gearing up to celebrate its three year anniversary and to say thanks to the community by hosting a Family Fun Charity Boot Camp Day. The trainers at Vancouver Fit Body Boot Camp are so motivating and truly care about you and your results. I am so happy to have found them because I don't where I would be today without it. I lost 24 pounds and went from a size 16 to a size 8! 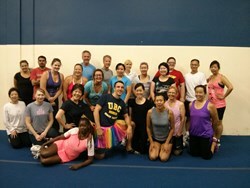 In an effort to give back and say thanks to the community, the popular Vancouver boot camp, Fit Body Boot Camp, celebrates its three year anniversary by hosting a Charity Boot Camp Family Fun Day on August 17 starting at 9am until 12 noon at its boot camp location at 1634 West 75th Avenue, Vancouver, BC. Vancouver Fit Body Boot Camp is accepting $10 donations for adults and $5 for anyone 16 years and under. There is also an option to bring in 2 non-perishable food items instead of the $5 kid’s donation minimum. 100% of the donations collected will go to the local charity PaperCup and Shelter program that helps to bring in at-risk youth and adults off the streets. They provide a much-needed service in downtown Vancouver where teens and adults who need it can take advantage of a warm bed, hot food, and a safe place to help them get through the night. Activities for the boot camp in Vancouver’s three year anniversary celebration includes family fun games, give-aways, and contests for prizes donated by local businesses as well as boot camp sessions set up for locals to come out and give it a try. Vancouver Fit Body Boot Camp is owned and operated by certified personal trainer Jonathan Lerner who holds a degree in Human Kinetics from the University of British Columbia. Lerner is committed to helping the Vancouver community lose weight and get in the best shape of their lives. Vancouver Fit Body Boot Camp is a part of the fitness boot camp franchise, Fit Body Boot Camp whose global goal is to expose and engage 20% of the world’s population in a more active and healthy lifestyle by the year 2020. To find out more about the fitness franchise, Fit Body Boot Camp or the Vancouver Fit Body Boot Camp location, please visit, http://www.myfitbodybootcamp.com and http://www.canadafitbodybootcamp.ca/vancouver-fitness-boot-camp/.